Gold prices drifted down on Friday on profit-taking after the dollar hit a seven-month peak and the metal failed to find support despite fresh trade skirmishes between the United States and China. US-China trade “has been very unfair, for a very long time,” said President Donald Trump, raising import tariffs to 25% on 1,100 different aerospace, robotics and auto-industry goods and spurring analyst and newspaper claims of a full-blown ‘trade war’. Gold priced in Dollars headed for a weekly loss of $9 per ounce while silver trimmed its gain from last Friday’s finish to 1.0%. Gold briefly touched a one-month peak on Thursday after the European Central Bank said it would hold off on interest rate hikes. But an accompanying surge in the dollar knocked it back. The dollar has been witnessing some great strengthening powers and that was largely held on to last week. Gold deepened losses after President Donald Trump on Friday announced that the United States will implement a 25 percent tariff on $50 billion of goods from China and Beijing quickly said it would hit back with its own tariffs. Analysts had expected gold to be bolstered by the prospects of a trade war. The International Monetary Fund said on Thursday that Trump’s new tariffs threatened to undermine the global trading system, would prompt retaliation by other countries and damaged the U.S. economy. Global and U.S. equities failed to revisit their record highs despite some strong first-quarter profit reports, stoking fears of a correction. On the other hand, as rate expectations out of Europe fell, the Dollar ran-higher and this provided a bit of pressure to Gold prices through the latter-portion of Thursday’s trade. It was shortly after the US open this morning that the selling really got underway, however, and Gold fell down to a fresh 2018 low, finding a bit of support just north of $1,275. The US Dollar put in a considerable move of strength on the back of that ECB rate decision, and prices ran all the way up to the October, 2017 high before starting to pull back ahead of this week’s close. This week’s economic calendar is noticeably light on US data, and the more interesting items are coming from rate decisions in Switzerland and the UK on Thursday of this week; so this appears to be an opportune time to evaluate the continuation potential of USD strength, and whether or not we can perch up to fresh 11-month highs. This is relevant to Gold prices as the two themes appear to be connected, even if the timing is a bit off. The heavy selling in Gold took place on Friday after the US opened for the day, and the Dollar had already started to pullback from resistance. 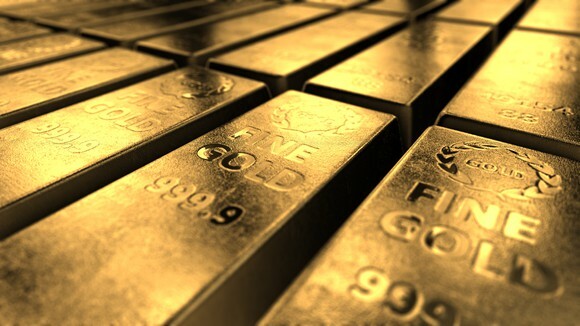 So, while it appears that there is some obvious connection here, there may be another factor at work as Gold prices displayed a delayed reaction to a rather sizable move of US Dollar strength.